There was a period in my life when I had three or four breadmakers. All used, of course, as a breadmaker is the sort of appliance that seems to wander around in search of a home. You probably know a couple people trying to give away bread machines they got for their wedding 15 years ago and never used, and they’re always on Craig’s List for $5, and they carom around on Freecycle like nobody’s business. So anyway, a few years ago I somehow came into possession of a breadmaker. I hadn’t used one in years. I used it once or twice with, you know, breadmaker-type results, and then it broke. Suddenly I keenly felt its absence. I couldn’t find the same model so I got a different one, and then I did find the same model so I got that too, and maybe I even got a third before I came to my senses, discarded the broken one, and gave the surplus breadmakers away. Phew. I will say this for my breadmaker: it makes a reliable whole wheat sandwich bread when we run out of the store-bought stuff. And what else do I want it for, really? I usually buy 100% whole grain sandwich bread because I have not found a 100% whole wheat recipe that works in my breadmaker. (Do you have one? Please, please share!) This recipe, straight from the Breadman manual, has been my go-to breadmaker loaf for years. It is moist with a sturdy crumb and a nice crust and it slices just right for sandwiches. You can get it going the night before and have a hot loaf waiting in the morning. It’s worth keeping a breadmaker around for (but just one). Whole Wheat Yogurt Sandwich Bread: In your breadmaker pan, combine the following ingredients in the following order: 1 c. plain nonfat yogurt, 1/2 c. warm water, 1 1/2 Tb. vegetable oil, 2 Tb. maple syrup, 1 1/2 c. whole wheat flour, 2 1/4 c. bread flour, 2 Tb. wheat germ, 1 tsp. salt, 2 tsp. dry yeast. Bake on your breadmaker’s setting for a 2 lb. whole wheat loaf. This entry was posted in Baking, Breads, Food, Grains, Recipes and tagged baking, bread, cooking, DIY, family, food, kids, lifestyle, recipes, whole grain on May 23, 2012 by emmycooks. The texture looks just perfect! ok, does your breadmaker have an express function? If so you are going to think I’m your best friend! 100% whole wheat bread, start to finish in one hour. Seriously. I totally tested it this morning! AMAZING. My 3 year old ate 3 slices while it was still hot. Throw it all in, push express, walk away. If you don’t have the express function use regular or whole wheat function and reduce yeast to 1 level teaspoon. Thank you for the recipe, Somer! I still have the soy lecithin and vital wheat gluten on my shopping list, I will let you know when I try it! Awesome, hope you can find them ;) Made 2 more loaves today, consistently good! That looks like a great loaf. I have100% whole wheat french bread and sandwich bread recipes that I use often but alas not in a breadmaker so I have no idea how they will fare in one. I also use “Atta” a lot in my 100% whole wheat bread and love how the texture turns out. That’s why its so commonly used in South Asian cooking to make hand rolled flat breads, puris etc. The texture is finer so it’s a win – win. It tastes delicate but has more protein, fiber and is more elastic. $5 breadmaker on craigslist?! Jeez! I should look that up when I am in Seattle because New York City’s scam-makers have the price of a used breadmaker parked around $45-50! Looking at this bread makes me seriously consider giving up some valuable counter-space for it. This looks great, Emmy! Does the yogurt make it tangy? And if you ever have any more superfluous breadmakers, I will totally give you $5! Sigh. No breadmakers on Freecycle in NYC. Maybe after the summer when all the weddings are over! We only eat bread at home in weekends, and all of it is made using a breadmaker. Whenever possible I just make the dough in my breadmaker in finish with the final rise in the oven with only the light switched on and baking in the oven. But it’s also great to wake up to fresh bread, despite the square shape and the hole in the bottom. The best way to get a good almost-wholewheat bread out of a breadmaker is to substitute about 20% good white flour and/or to add vitamin C (ascorbic acid). If your breadmaker doesn’t warm the dough for the rise, it also helps to use 80F water and/or to put the breadmaker in a warm space. My recipe is very simple, add ingredients in this order: 20 grams fresh yeast, 1 Tbsp sugar, 400 grams wholeweat meal, 100 grams white bread flour, 1/2 tsp pure vitamin C, 1 Tbsp salt, 2 Tbsp extra virgin olive oil or butter, 300 grams water. PS most commercial bread is made with all kinds of junk it (including disgusting-sounding stuff like ground pig’s hair) to give it longer shelf life and make it rise properly. Pig’s hair? Ick! Luckily I can get local bread that doesn’t have any suspect ingredients in it. :) So if I follow this recipe, can I just leave out the Vitamin C? Or if not, what should I look for? Is it a liquid? Powder? I don’t think I’ve ever seen that before. Thanks very much for the recipe! Yes you can try to leave out the vitamin C, but it will be better if you do use it. It is a powder. I think you could substitute with a crumbled vitamin C tablet, but that will also have sugar, flavoring, etc. in it. It might be easier to find if you google for ascorbic acid rather than vitamin C (which is the exact same thing). I was always very skeptical about bread makers – but this looks awesome. I have a tasty whole wheat and molasses bread recipe, but must confess I usually buy mine from the farmers markets – so many good ones to choose from, and I love supporting anyone who makes great fresh local food. I just searched your site for your bread recipe but no luck. :) I will keep watching in case you are inspired to post it! :) I do love buying bread from local bakeries–always delicious and less time-consuming than making it myself! I used to use my breadmaker a lot, but now I’m trying a variety of no-knead artisan breads. That said, I still have the machine and may well use it from time to time. I’ve made some delicious bread in mine, and yours sounds quite tasty too! We went through a time when we made tons of no-knead bread but for some reason we’ve fallen off that wagon. It was so good, though–I should get back in the habit! I’m a little skeptical about bread makers, I’ve never used one, I make my bread from scratch but still find it a little difficult to make a good wholewheat loaf without it being a little dense. 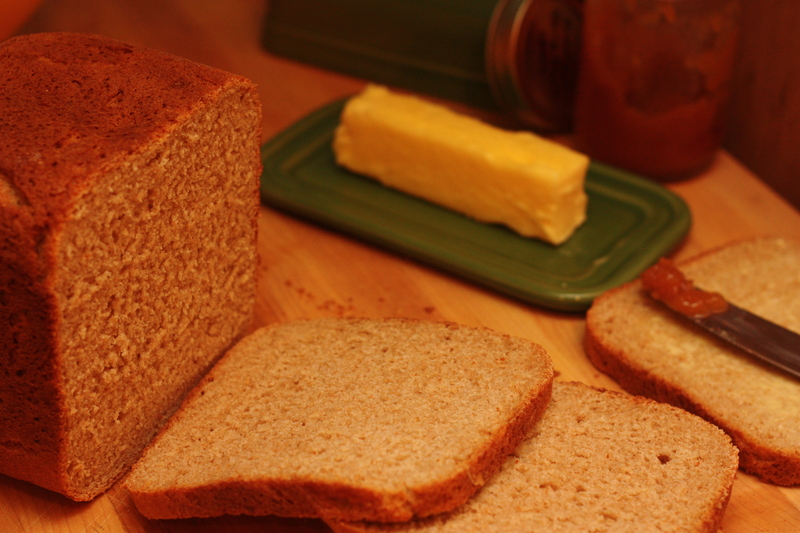 Have you ever considered making it without a breadmaker?